My mum discovered this recipe on an old notebook while cleaning out some old belongings of my grandmother (aka Ah-Mah). Among the other recipes featured in the notebook was "dishwasher steamed fish" -- perhaps not so energy efficient, but certainly intriguing. Since we've had beautiful carrots for awhile and cabbages and cucumbers are starting to come on in abundance, it seemed like the perfect time to test out the recipe. The salty, sour, spicy pickles are just the thing to cool you down on the swelteringly hot days we've been having lately on the island. My mum is coming to visit this weekend, and I'll ask for her stamp of approval. Until then, there's the fact that I ate more than a quarter of the pickles, picking out a cauliflower here and a sesame-strewn carrot there, while packing the jars and taking the photos. 7 dried arbol chillies (soak in water and drained) + 1 large dried New Mexican chili OR 1 ½ tbsp. 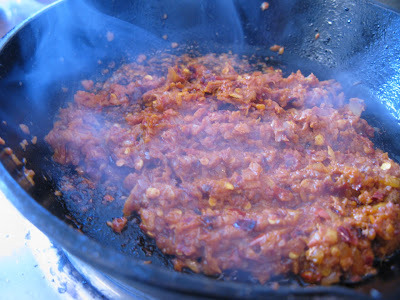 chilli paste + 5 fresh red chillies. Wash the cucumbers and cut off the ends. Julienne the cucumber into strips 2'' long and 1/4'' wide and 1/8'' thick, removing and discarding seeds and soft insides as you go. 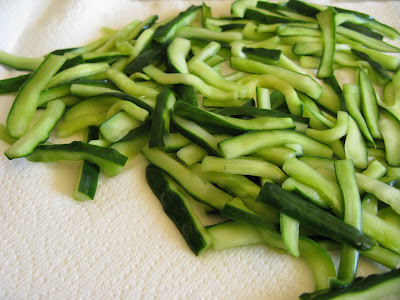 Place the cucumber strips in a bowl, sprinkle with salt, mix well and leave aside for 4-5 hours. Rinse, drain and squeeze out as much liquid as you can. Set aside. 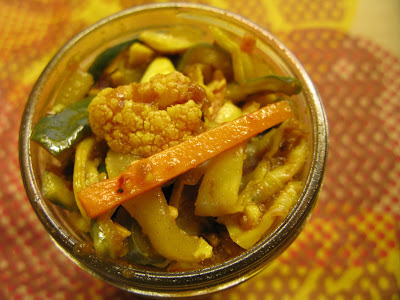 In the meantime, you can prepare the pickling juice. 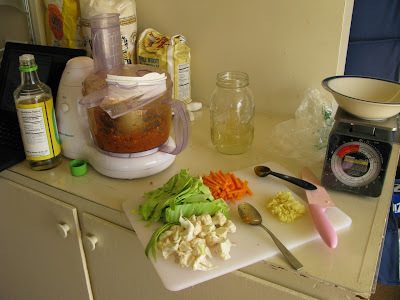 Process Ingredients A into a paste, either with a mortar and pestle and brute force, or with a food processor. Set your paste aside. Heat oil in a wok and fry the ginger till light brown. 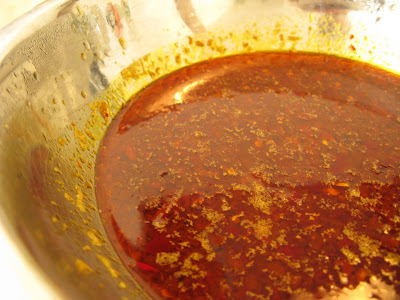 Add paste A and stir-fry till the mixture turns deep red, becomes fragrant and the oil comes up to the surface. Add B and bring to a boil. Boil for a minute and remove to a bowl to cool completely. 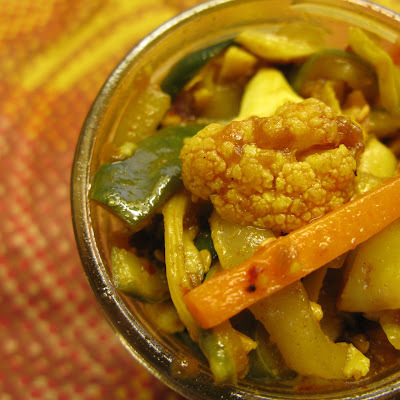 Boil C in a pot and blanch the cucumbers, cauliflower, carrots and cabbage separately. 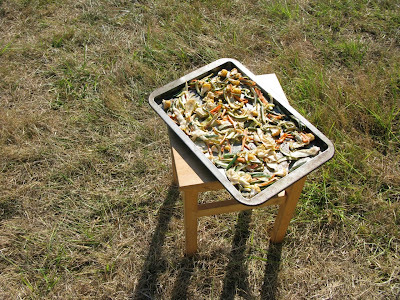 Spread out to cool on large trays. 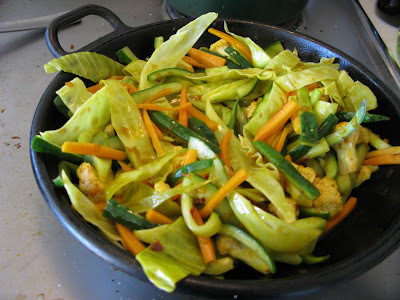 Heat a wok and stir-fry the vegetables for 1/2 minute with a little bit of the oil from the vinegar mixture, skimmed from the top. Spread on trays to cool. 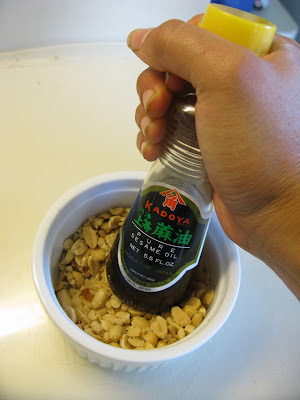 When vegetables are cool, place in a mixing bowl with the pounded nuts, sesame seeds and chilli-vinegar mixture. 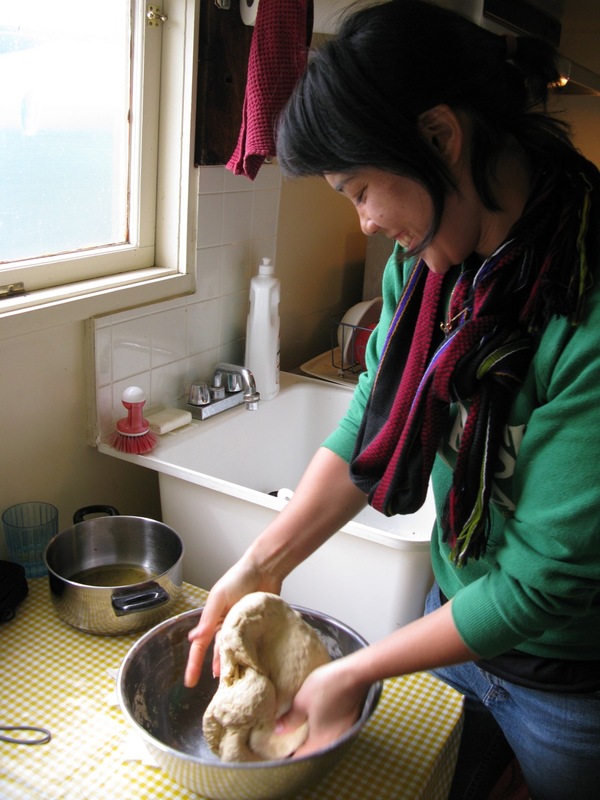 Mix well, store in bottles and refrigerate. These look really really good. May have to try that soon. How long do they keep (assuming you can exercise restraint...)? I honestly don't know because I haven't made them before and it wasn't specified on the recipe. When my mum asked, she said they never refrigerated them back when she was a kid, but they went so fast it didn't matter. I'd say with all the vinegar, they'd keep min 2-3 weeks in the fridge, and likely much longer. 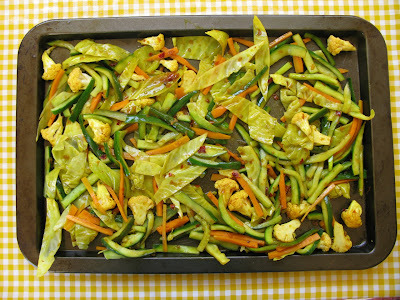 You might even be able to modify the recipe and properly can the veggies. I'd recommend caution though, and recruit an experienced canner to help since you can get quite sick from botched canning experiments.